In Fay’s blog from last week she mentioned the Under25Routes artists had been invited along to Waterhead Academy to have a discussion with the schools drama club and watch their performance. 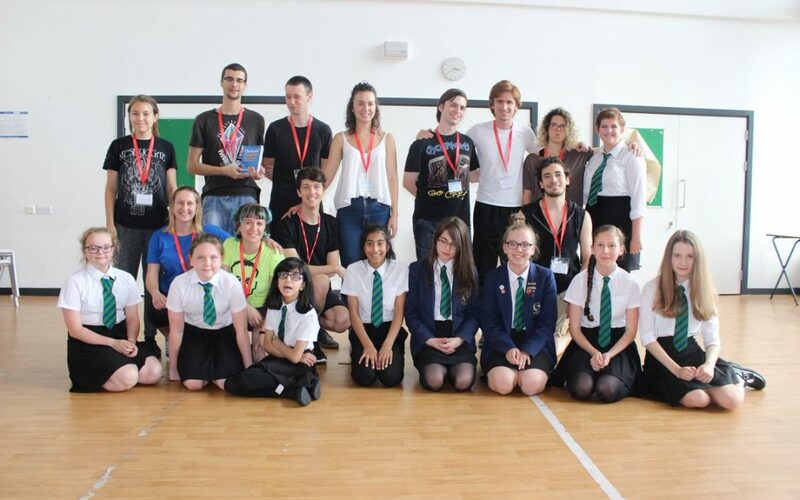 Peshkar Productions has worked with Waterhead Academy over the last ten years. Over the past two years we have worked closely with Ms Eckhardt – the schools’ Head of Drama – ensuring the drama and performance provision we bring into the school is engaging, challenging, inspiring and helps across students studies to improve attainment. This term Steph Meskell-Brocken and a selection of the Under25Routes UK artists have been delivering a number of mixed art form workshops with students – as part of their career pathway programme, through which they have devised performance pieces and also achieved their Bronze Arts Awards. Being able to bring all of the Under25Routes artists to Waterhead Academy has been exciting for Peshkar to do. Peshkar, we are glad to say, will continue to work with Waterhead Academy during 2017/18. Taking our relationship into it’s 11th year.